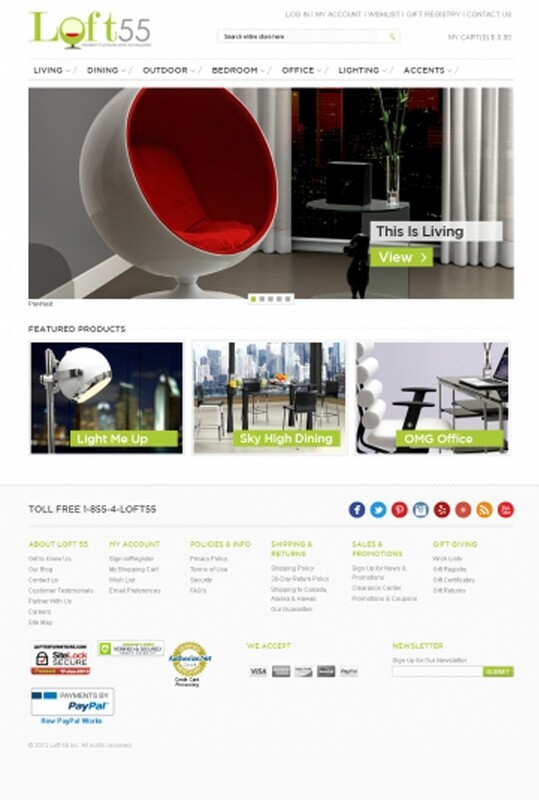 Client Profile: Online furniture store for sale of modern furniture and accessories. Challenge: Improvising some functionality of his existing Magento based store for furniture products. The client approached us with the requirement of improvising some functionality of his existing Magento based store for furniture products. Loft55furniture.com is an online furniture store for sale of modern furniture and accessories. Users can shop aesthetically pleasing furniture for their living room, bedroom, dining room, office besides a wide range of lighting products from this store. Users can also make an account on the store to make purchases as a registered customer. Working on this project, we extended the core functionality of Magento. In the front end, we created the Bundled Configurable Products which the backend admin could manage with ease. We also added the functionality to allow admin upload products in bulk. On the home page, we added a slider carrying attractive pictures of the furniture products. This home page slider imparts a bold & nice look to the furniture store.